The sun has been shining all week and it’s felt really nice. I’ve not had my big winter coat on or my boots and I love it. As much as I love my boots, I do get to a point where I’m ready to put them away until next winter. It’s been a quiet week for me, I’ve not met up with anyone and that has made a real difference to my week I think. I talked last week about how I try and meet up with a friend once a week and what a difference it makes to me. When this doesn’t happen, I can feel the affects. I need to make sure I have it booked it! Proud Day… Last Friday morning Andy and I went to the school assembly, as one of the girls was receiving an award. We didn’t know which one, until Holly’s name was read out. I was so proud of her and she looked so little stood up at the front smiling at us with her certificate. Later in the assembly, much to our surprise Alice then got presented with an Headteachers award and it was a double proud moment for us. They both try so hard at school and we were proud to see them be recognised. New Bikes … On Saturday Andy and I collected our bikes. I’m working with Halfords again on a collaboration and this time it was for Andy and I to get bikes and I’m so excited. The girls are now at an age where we can enjoy family rides together and with the weather getting nicer, its the perfect time. Friends Over … On Sunday our family friends came over with their 2 daughters, who are similar ages to our girls. I cooked us a roast dinner and then we went out for a walk and the girls all went on their scooters. I said to my friend how had we got to the stage where the youngest of our girls gang is nearly 5! They’ve known each other their whole lives, and it definitely does get easier as they get older. Mind you wait until they are all teenagers!!! Walking to school… This week the girls and I have been walking to school as the weather has been nicer. Obviously its nice for them, but I did it for myself too. As I want to try and do more exercise and it means on the way back I can go for a slightly longer walk. It’s a nice start to my day and I’m hoping it will make a difference to how I’m feeling. Dinner with a friend… I went out for dinner with my friend and it was really lovely to catch up. Some friends just get you and you get them and you can just talk and talk. It’s almost like therapy!! We also had some lovely food and it was such a great evening. We really should do it more often. This weekend… Andy and I are heading to Brighton once we’ve dropped the girls off at school today. Andy is working down there and I’m going to go shopping and sit in a cafe and read my book. I can’t wait! When Andy finishes we will check into our hotel for the night and then head out for dinner. We haven’t had anytime just the two of us since July and we can’t wait! Then on Sunday it’s Mothers Day and we are hoping the weather stays nice and we can head out for the day with there girls. Previous Post: « When Social Anxiety Takes Hold Of You! OH my goodness that sweater and skirt is beautiful!!! 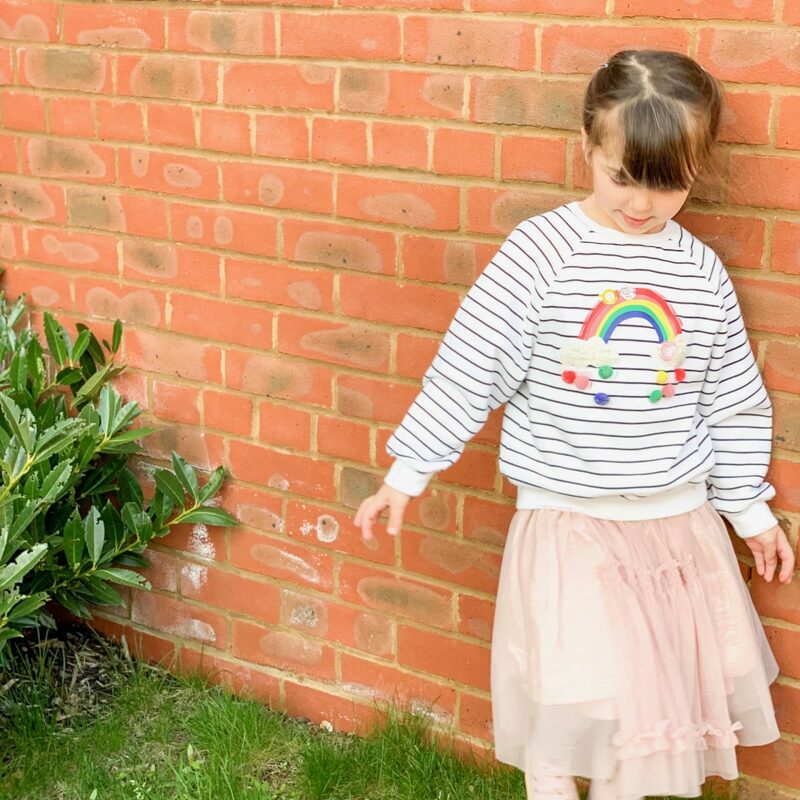 Love the stripes and rainbow. Sounds like a fab week have a wonderful weekend ahead hoping in the sunshine!!! Ah it sounds like you’ve had a great week! 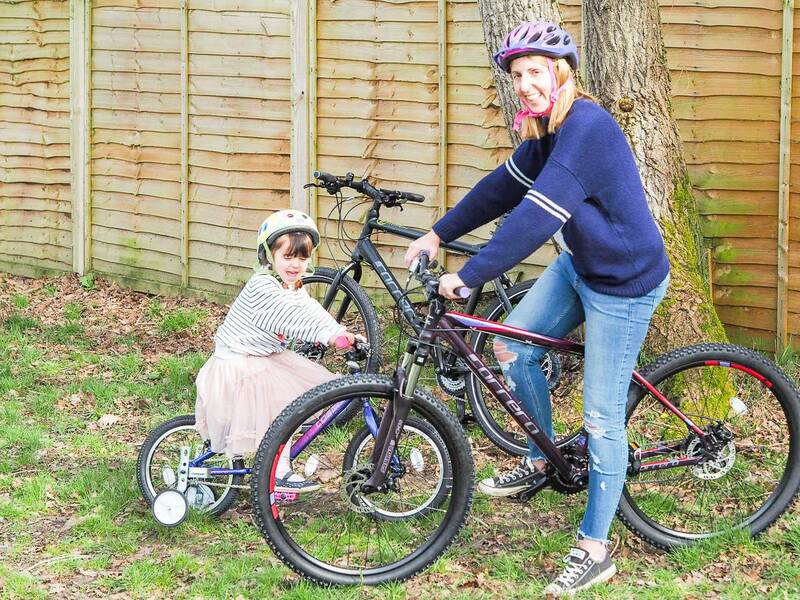 The bike looks great – Halfords have an amazing range! Well done to the girls too in their assembly! We walk to school and it is such a lovely way to start the day. Love your new bike, we have an adventure planned this week and we are taking bikes – I haven’t been on a bike for years so I feel a little nervous!! I hope you had a great time in Brighton! Hope you enjoyed your weekend in Brighton, a childless weekend sounds perfect!